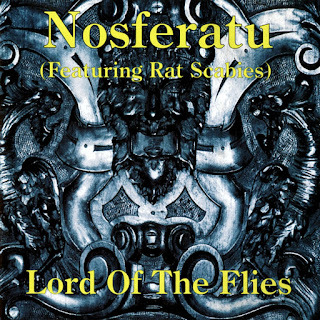 Nosferatu wasn't the most innovative goth band of the 1990s, but it was certainly among the most consistent -- and that is in spite of all the many personnel changes it went through during that decade. Recorded in 1997, Lord of the Flies finds Nosferatu's Dominic LaVey/Damien DeVille/Doc Milton lineup joined by guest drummer Rat Scabies (formerly of the Damned) on three of the eight tracks: "Ascension," "Torturous," and "Witching Hour." Guitarist DeVille was, by that time, Nosferatu's only remaining original member; LaVey was its third lead vocalist, and Milton was the third person to serve as the band's bassist. Regardless, the band of 1997 didn't sound much different from the one of the early 1990s. Moody yet rocking tracks like "Six Feet Below" and "The Gauntlet" break no ground for the Bauhaus-influenced goth rockers, but Nosferatu has no problem sounding focused or being consistent. While Lord of the Flies isn't innovative or expansive, it is undeniably solid.